Hundreds of Service Employee International Union (SEIU) Local 1 janitors and other city laborers endured the sweltering 80-degree temperatures, similar to the conditions they face every day at work, to lobby for good union jobs and fair wages. The group assembled around the Spirit of Detroit on Woodward and Jefferson to launch the “One Detroit” campaign, which calls for equal opportunity for all Detroiters. Based in Chicago, SEIU Local 1 represents about 50,00 workers, which includes janitors, security officers, food service workers and others, across the Midwest. Currently, janitors in downtown Detroit buildings are forced to raise their families on hourly wages ranging between $9.25 and $12.45. Median annual earnings for janitors are so low that many working families rely on public assistance just to make ends meet. 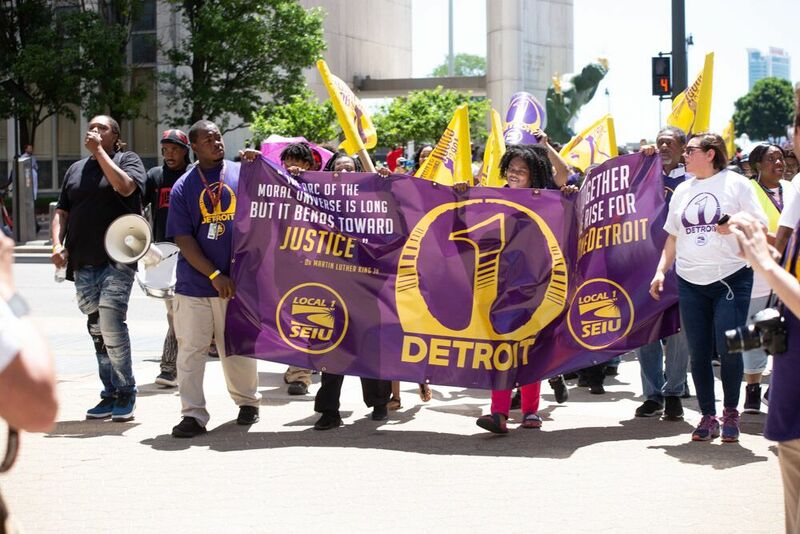 SEIU was joined by other community allies, including Detroit for $15 and Detroit People’s Platform, city council members, and other elected officials standing up for the everyday workers of Detroit. Wearing purple shirts that read “1 Detroit”, they marched around downtown, up Woodward and around Campus Martius, then headed south down Griswold and over to Cobo Center, which led them right back to the Coleman A. Young Municipal Center. With bullhorns in hand, the protesters demanded that all city janitors be paid a minimum of $15 an hour, with chants of “We work, we sweat, put $15 on my check”, “I want my $15″, and “Majority Black Detroit Matters.” With the resurgence of new developments all across the downtown market, as part of the One Detroit campaign, participants urged downtown building owners to ensure that the hardworking janitors who clean and secure their buildings also benefit from that resurgence and are paid at least $15 per hour. They also called on building owners to allow contracted workers to form their union and negotiate better wages without interference. And while the fight started with Detroit janitors, they said they will not stop until all workers across the city of Detroit, including airport, arena, fast food, and others, are sharing in and experiencing the real benefits from the resurgence of Detroit. Known as a true fighter for the people of Detroit, City Council President Brenda Jones spoke to the union members and said she stands with the janitors and their union in the campaign for better jobs and higher wages. Jones also she is sure a Detroit City Council resolution will be passed next week to allow downtown janitors to earn a minimum of $15 an hour and unions should have the right organize without any intimidation and interference from the employer.